Monday 12th Nov 2018 and I found myself travelling excitedly along the beautiful North Sea coast en route to the Launch of Interfaith Week in Scotland. Arriving early to help with setting up meant that I had time to drink in our venue with its beautiful paintings and wood panelling. The Town House in Aberdeen made a spectacular occasion even more spectacular. Its Scotts Baronial architecture and exceptional interior were stunning. Finding room for the miles of art work for Interfaith Scotland’s Art competition was no challenge in such expansive rooms. Once signposts had been put in place to guide guests through the Town House and tables had been prepared, it was time to greet our flow of guests and flow they most definitely did! It was great to see so many from all sections and faith groups and non-faith groups too. 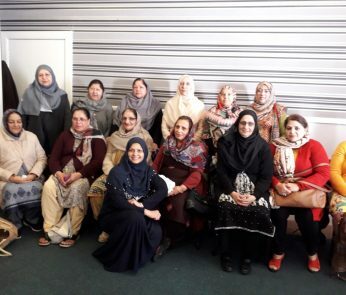 There was quite a party atmosphere where people were re-united with old friends from other interfaith events and the chattering and mingling began. Patricia, a Quakers who Chairs Aberdeen Interfaith Group had brought a luminous tree, the size of a small Acer Tree which lit up our reception room giving a warm light and warm welcome to the event. 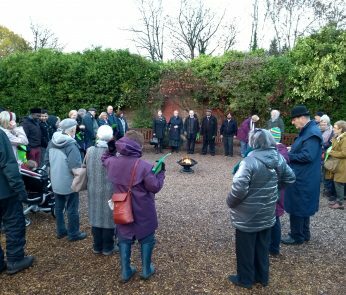 The leaves of Patricia’s tree cascade downward like a weeping willow, each leaf with its own gentle light, and guests were invited to attach their own leaves, in addition, on which were written their dreams for interfaith relations. Lively display boards from several different groups lined the way to the main room in which the scheduled events would be performed. I got a kick out of watching people’s faces as they opened the door to this incredible space. The local turnout was a little more blasé and there were plenty of them! Aberdeen Interfaith Group were well supported by their regulars. The first port of call was the buffet table for a lovely and varied buffet to suit all tastes. My favourites were the samosas. With plates piled high with goodies our guests made their way to their tables chattering en route. Time for the varied programme to start. 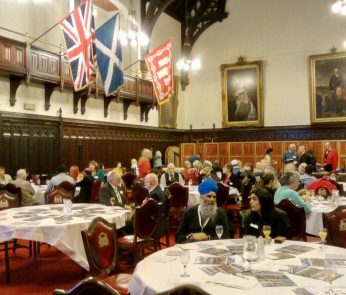 The Lord Provost of Aberdeen and Maureen Sier, the Director of Interfaith Scotland were old friends and had been involved in interfaith causes as student’s together decades before. Lovely to see them both still working for justice, peace and interfaith, and we enjoyed the humour of their friendly banter. The variety of events made a creative mix in which so many faith groups were represented. There was a lot of singing and dancing, music and laughter. Tips aplenty from tried and tested work with inter-generational groups flowed. Youth contributions were outstanding and they weren’t slow in telling us old fossils exactly how to do it from their perspective and even more valuably how NOT to do it too! Another fun part was when the individual tables had an opportunity to share with their neighbours on those tables and we had space to brainstorm some ideas, exchange approaches, talk and listen. It was great getting to know some wonderful people! All too soon the evening was over and it was time to pack up and head home. 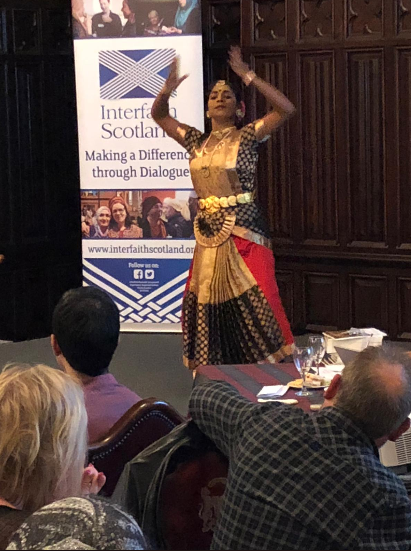 As people slowly trickled out you sensed that they were reluctant to go in many cases as it had been a really well attended, fun and vibrant start to interfaith week and it meant saying goodbye to friends old and new. But sadly the long journey home had still to be faced for many and although not far for me, as I was staying locally, I quickly fell in to a very contented but exhausted sleep. Prev post Winner for our Scottish Interfaith Week Art Competition!